The illustration shows the atoms of a gold cone exposed to a strong electric field. 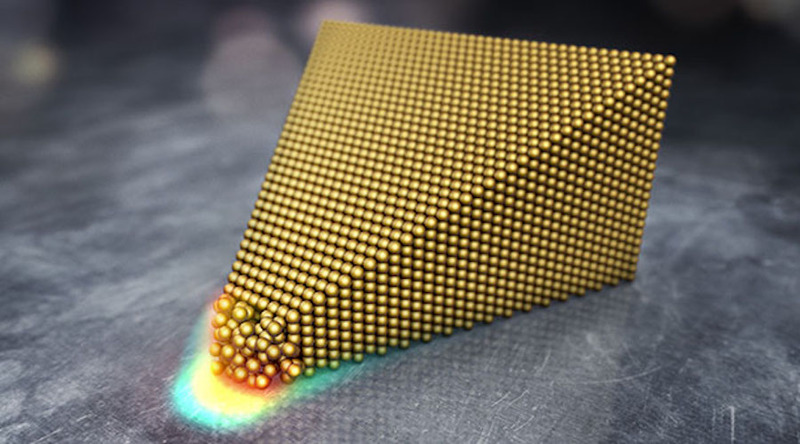 It also shows the field (around the tip of the cone) that excites the gold atoms. They break almost all their connections to each other and the surface layers begin to melt.​ ​Illustration: Alexander Ericson. Provided by Chalmers. The discovery came as a fluke after the scientists started analyzing the yellow metal to its most intrinsic and smallest components. First, they placed a small piece of gold in an electron microscope. Then they started observing it at the highest level of magnification and began gradually increasing the electric field to extremely high levels. When they reached the highest electric field, they noticed that the surface layers of gold had actually melted – at room temperature. "I was really stunned by the discovery. This is an extraordinary phenomenon, and it gives us new, foundational knowledge of gold,” Ludvig de Knoop, a researcher at Chalmers, said in a media statement. De Knoop explained that what happened was that the gold atoms became excited and under the influence of the electric field, they lost their ordered structure and released almost all their connections to each other. After seeing this, the scientists ran some theoretical calculations. Such work allowed them to hypothesize the reasons behind gold's ability to melt at room temperature, which has to do with the formation of defects in the surface layers. The academics published their findings in a scientific paper that appeared in the journal Physical Review Materials. In the article, they say the results of this experiment open up new avenues in materials science. "Because we can control and change the properties of the surface atom layers, it opens doors for different kinds of applications. For example, the technology could be used in different types of sensors, catalysts and transistors. There could also be opportunities for new concepts for contactless components," Eva Olsson, one of the co-authors of the paper and a Professor at the Department of Physics at Chalmers, said.